Finally the wait is over. 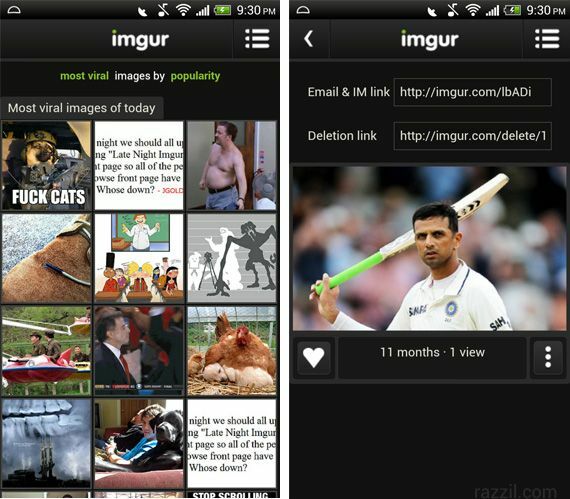 The favorite image hosting Imgur just released its Android app on Play Store for free. Imgur provide a platform where Users can interact with images by commenting and voting, or submitting their own image. The Uploader makes sharing images with the Internet simple. You can use Imgur to share an image or album with a friend or post on a message board, blog or social networking site. You can manipulate the image to your liking and automatically share it with your social network of choice. With the Official Imgur Android app, users can browse the most viral images on the site, comment and vote on images, upload image straight from your phone, manage your imgur account and submit images directly to the imgur gallery. The app is still in beta and it requires Android 2.1 and up.